The global thyristor market was valued at US$ 4,035.0 Mn in 2017 and is projected to register compound annual growth rate (CAGR) of over 7.0% from 2018 to 2026, according to a new report published by Transparency Market Research (TMR) titled “Thyristor Market – Global Industry Analysis, Size, Share, Growth, Trends, and Forecast, 2018–2026.” The report suggests that the rising population and urbanization is likely to spur the demand for thyristors in the coming years (2018 to 2026). Other factors such as replacement of aging infrastructure and government initiatives are also expected to help the market expand rapidly. As key players introduce new thyristors and features in developed markets such as North America, Europe, and Asia Pacific, these regions are likely to account for dominating share of the global thyristor market. 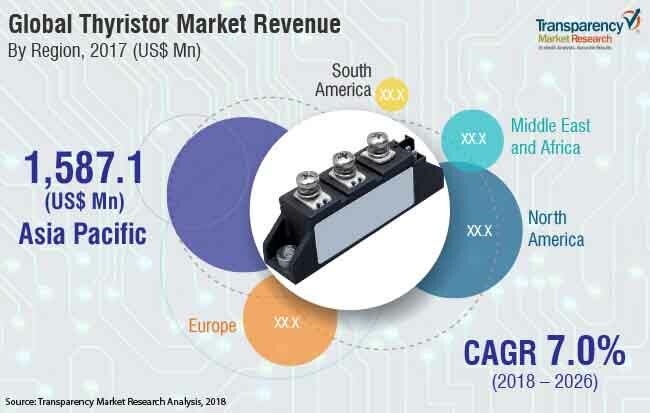 Growing demand for thyristors from the consumer electronics sector in emerging markets such as China and India is likely to boost growth of the Asia Pacific thyristor market at a growth rate of around 8.4% from 2018 to 2026. The replacement of aging infrastructure especially in the energy sector is likely to drive the thyristor market. Thyristors are much more efficient than their substitutes and replacement of older equipment is likely to spur the market growth.The increased efficiency of thyristors during transmission and distribution of power also provides considerable cost savings.Thyristors have a higher penetration in developed economies as compared to developing economies. Based on application, the global thyristor market is segmented into industrial electronics, consumer electronics, communications, and automotive electronics. By 2026, the consumer electronics segment is expected to hold about one third of the total market and expand at a rapid rate throughout the forecast period.Thyristors not only improve efficiency, but also reduce maintenance cost compared to conventional solutions.In terms of power rating, the market is segmented into below 500MW, 500-999MW, and above 1000MW. Primarily driven by the demand from urban regions, the 500-999MW segment held the major share of the revenue in 2017. On the other hand, the below 500MW segment is anticipated to expand at a rapid pace due to the increasing demand from increasing population around the world. In terms of value, Asia Pacific was the leading contributor to the global thyristor market in 2017. The contribution is primarily due to the increased adoption of thyristors with the presence of well-established players across the region, especially in China and Japan. Asia Pacific is also expected to emerge as the region showcasing the highest CAGR. Furthermore, the region is witnessing high adoption of thyristors because of the increasing demand for energy to support local manufacturing units. Major players in the thyristor market include ABB Ltd, Siemens AG, Schneider Electric SE, Eaton Corporation Plc., Honeywell International Inc., Analog Devices, Inc., STMicroelectronics N.V.,Infineon Technologies AG, ON Semiconductor, and Fuji Electric Co., Ltd.
Each TMR syndicated research report covers a different sector - such as pharmaceuticals, chemicals, energy, food & beverages, semiconductors, med-devices, consumer goods and technology. These reports provide in-depth analysis and deep segmentation to possible micro Levels. With wider scope and stratified research methodology, TMR’s syndicated reports thrive to provide clients to serve their overall research requirement.